Thursday, the stock market dropped and dropped hard. As soon as the opening bell rang Thursday morning, almost two hundred points disappeared from the Dow Jones. All over the world, including the United States, many are fearing economic collapses. As a result, the stock market is falling. On Thursday, reports on the economy by Morgan Stanley came in worse than previously thought, reports on the housing market came in negative, and reports on American manufacturing expressed a decrease in progress. At the end of the day, the Dow Jones fell below 11,000 points to 10,991. It was a drop of 420 points. 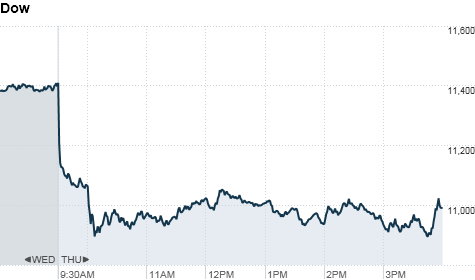 The S&P 500 fell 53 point to 1,141. And the Nasdaq dropped 131 total points to finish at 2,380. For those investing in gold there was some good news, the material ended the day at a record end of day high of $1,822 per ounce. The economy, as illustrated by the stock market, has been slipping hard as of late. With growing problems in both the American economy and the international economy, the near future is without a doubt cluttered in doubt.